These Thai traditional Sawaddee on elephants represent Thai culture. They are sold as a pair and provide you with twice the appreciation of carved wood craftsmanship. A really unique exhibition of creative wall art! Please note that you may see a slight difference in color as compared to that seen on your computer screen. Also, since most products are handmade and they are crafted from natural wood, there may be a slight size variation. 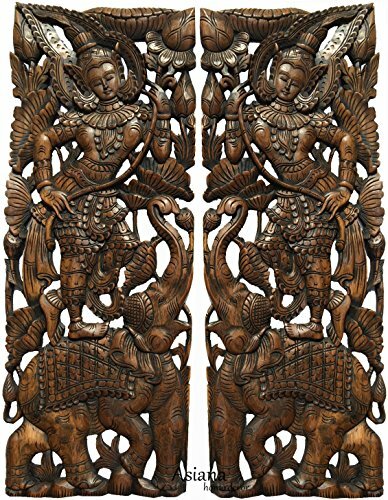 Large Hand Carved Panel Extra Thick in Dark Brown Finish, absolutely charming in any room of your home. Baan Tawai, Chiang Mai, Thailand, Large Gold Antique Handmade Spirit House Temple Haunted House Temple.